The mechanism for the L-H transition is a 34-year long standing mystery in the field of magnetic fusion. It is widely conceived that shear flows play a key role in L-H transition. However, the origin of shear flows and how shear flows lead to turbulence suppression are still ambiguous. Thus the evidence discovered recently in Experimental Advanced Superconducting Tokamak (EAST) experiment will contribute to the understanding of this important problem in the field of magnetic fusion. A significant progress towards the better understanding of the mechanism underlying turbulence suppression at the low-to-high (L-H) confinement transition has been made in the latest research on the EAST in the Institute of Plasma Physics, Hefei Institutes of Physical Science (ASIPP). In a recent experiment, EAST team conducted probe measurements and model analysis, which, for the first time, observed that the L-H transition occurred spontaneously mediated by a shift in the radial wave number spectrum of turbulence. Radial wave number spectral shift and turbulence structure tilting took place tens of milli seconds prior to L-H transition at the plasma edge. Across the L-H transition, the spectral shift accelerated and the local turbulence got suppressed. In addition, the spectral shift appeared to be correlated with the time evolution of radial electric field shear at the plasma edge. In the geometry space, the spectral shift manifests itself as ordered turbulence eddies tilting, which scatters the turbulent energy to higher wave number region where the turbulence energy is dissipated. It leads to local turbulence suppression. The high-confinement mode (H mode) is the projected baseline operational scenario for the International Tokamak Experimental Reactor (ITER). ITER relies on the high confinement of H-mode to achieve its scientific mission. However, at the beginning of ITER operation, its auxiliary heating power is limited. There is still uncertainty for the H-mode access on ITER in its early phase. Therefore, improvement on the understanding of the L-H transition is in need. Although recent work on EAST still cannot completely uncover the mystery of "L-H transition", these new findings represent a substantial and novel advance in this important area of magnetic fusion research, which may open a new path of inquiry in future work. 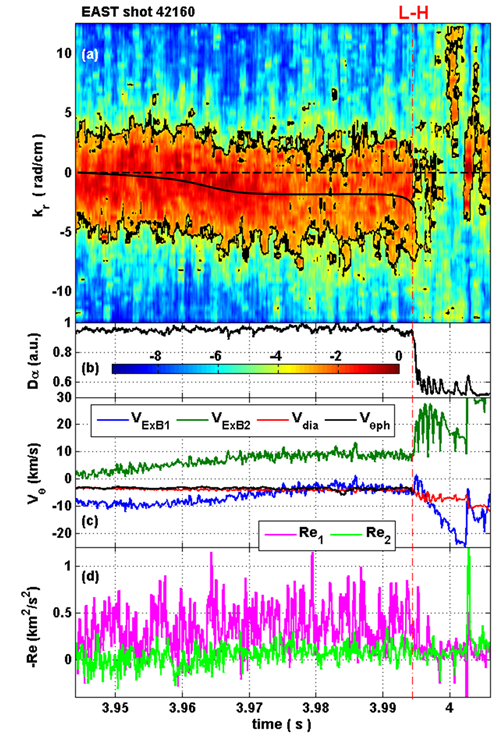 The related work was published recently in Physical Review Letters with title Low-to-High Confinement Transition Mediated by Turbulence Radial Wave Number Spectral Shift in a Fusion Plasma.